In theory, virtualizing all your old servers is a good idea, but managing them won't necessarily become any easier. Virtual Machine Manager gives Windows administrators an easy option. Service virtualization is no longer just an interesting topic for large corporations and datacenters. In fact, virtualization of multiple server systems on a single physical machine has become an affordable option for small and mediumsized businesses, too. With virtualization and the consolidation benefits that it offers, system management also changes. The machines you are managing are only available as virtual entities and as the number of virtual machines and virtualization hosts continues to rise, administrators need to consider centralizing their management. 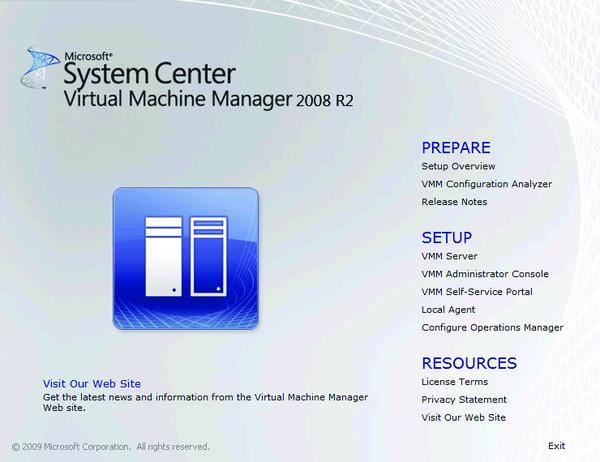 Microsoft System Center Virtual Machine Manager 2008 R2 (SCVMM) is a management solution for HyperV (R2) hosts, Virtual Server 2005 R2 hosts, and VMware ESX hosts that use the VMware VCenter. SCVMM  offers excellent scalability, easy management of hosts and virtual machines and many benefits for the administrator. A Workgroup Edition is available for deployment in small and mediumsized businesses: If you use a maximum of five hosts, this version is a costeffective way of managing an unlimited number of virtual machines. To install SCVMM, you need a 64bit version of Windows Server 2008 (R2), which you can run as a virtual machine in smaller environments (with a maximum of five hosts). The system on which you install SCVMM must be a member of an Active Directory domain, but you can use it to manage host systems in nonmember networks. In this case, you'll need to install the agents manually because automatic installation only works inside the domain. SCVMM relies on Microsoft SQL Server to store data. Depending on the size of your environment, you can use the free SQL Server 2005 Express Edition supplied with the bundle, which has a database size limit of 4GB, or you can use an instance of SQL Server 2005 or SQL Server 2008. It makes sense to use a separate server for the database in larger environments. You can install the SCVMM database component on a separate system; it doesn't need to reside on the management server. To install the management component in SCVMM you also need the Windows Automated Installation Kit (WAIK) 1.1, which is automatically installed when you install the management server, Windows PowerShell 1.0 or 2.0, Windows Remote Management (WinRM) 1.1 or 2.0, and the .NET framework 3.0 (SP1). The webbased SCVMM SelfService Portal additionally requires Internet Information Server (IIS) version 7.0 or 7.5. The SCVMM management console can also be installed on client systems such as Windows Vista and Windows 7. If you also want to send commandline jobs to SCVMM via the client, you will additionally need to install Windows PowerShell clientside. After starting the installation, you'll be given a choice of components to install for SCVMM (Figure 1). The management server, management console and selfservice portal are installed separately. When you install the management server, you can place the individual modules, such as the database and the library server, on different systems. This improves performance if you have a large number of hosts and virtual machines. Before the installation starts, an automatic check is performed to make sure that the hardware and software requirements are fulfilled. If this is the case for all the components, provisioning SCVMM will take less than 20 minutes. Before installing the selfservice portal, you must enable the web server role on Windows Server 2008 (IIS 7.0) or Windows Server 2008 R2 (IIS 7.5) as well as the ASP.NET, IIS6 metacompatibility and IIS 6 WMI compatibility role services. If the role or one of the additional services is not installed, you will see an error message to this effect. Portal access privileges are configured in the management console preferences. Figure 1: The Virtual Machine Manager startup screen shows a selection of the components to install. The agents for managing hosts via SCVMM can be installed through the management console or manually. If you use the management console for the install, an automatic check is performed to see whether the host has a hypervisor. If this is not the case, the HyperV role will be installed automatically on Windows Server 2008 (R2), and Virtual Server 2005 R2 will be installed on Windows Server 2003 (R2). Microsoft offers a free configuration analyzer for SCVMM; after the install, the analyzer checks whether all the components are installed optimally. You can also use the configuration analyzer to check the configuration on remote systems that you will be deploying as hosts and systems intended for P2V conversion. If any issues are detected, you'll be given a detailed description and possible solutions. To use configuration analyzer for SCVMM, you also need the free Microsoft Baseline Security Analyzer. The SCVMM management console gives administrators the ability to handle a full set of host and virtual machine administration tasks. The management console is clear cut and configurable in many places. The console is divided into three areas (Figure 2). The lefthand panel contains the navigation aids for the various SCVMM subsections (hosts, virtual machines, libraries, jobs, and preferences). After selecting a subsection, its objects are listed in the central panel of the console. The righthand panel shows you the actions available for the selected subsection. 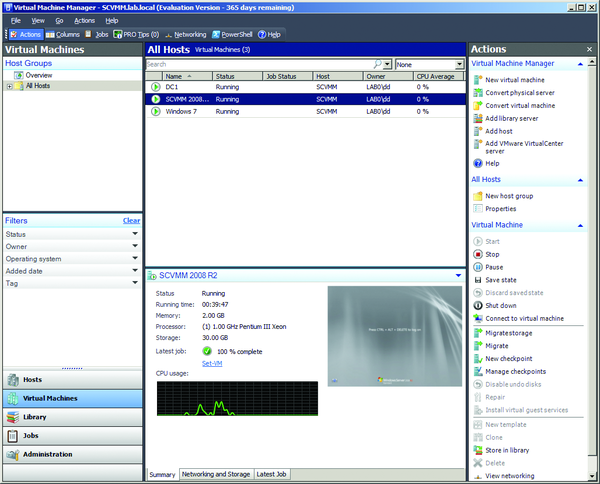 Figure 2: The management console gives you an overview of the virtual machines in the central panel and the system load for the selected VM below. The Hosts and Virtual Machines subsections give you a perfect overview of the status of all your systems. If you manage a large number of systems, you can use the filters in the navigation area on the left to restrict the number of systems shown. The Jobs subsection is used to check all active SCVMM jobs (Figure 3); again, you can use the navigation aids to filter on various criteria. This helps you quickly identify and resolve errors and issues. Figure 3: The Job queue shows modified and outstanding jobs. In the face of competition from VMware, Microsoft has polished its own Hyper-V virtualization solution and firmly integrated it into Server 2008. The Proxmox distribution specializes in virtualization, letting you deploy and manage virtual servers with OpenVZ and KVM at the same time. Version 5.6 of Citrix XenServer is a feature-stripped version of the virtualization product and is available free, in addition to the commercial Advanced, Enterprise, and Platinum editions. The OpenNebula cloud middleware system is one of the easiest private clouds in the sky. We'll show you how to get started.